A scheduling template is a set of time blocks that you set up to reserve periods of time on your schedule in each operatory and on each day of the week for certain types of services and other activities. The time blocks appear on the calendar as a guide for which types of appointments to schedule on which days of the week, at which times of the day, and in which operatories. However, since Dentrix Ascend does not restrict you from scheduling any type of appointment in any time block, your office's policies regarding scheduling will have to determine how strictly staff members who schedule appointments should adhere to the purpose of any time block. In contrast, time blocks that are set up to allow patients to schedule appointments online allow patients to schedule only the specified types of appointments in the corresponding time slots online. 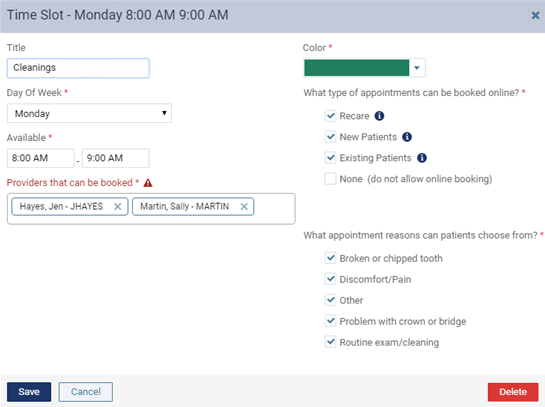 To create a scheduling template, set up time blocks that specify when, with whom, and in which operatories you can schedule appointments for patients and that specify, for online booking, which types of patients can schedule appointments online and the appointment reasons that they can choose from. Note: Time blocks are location specific (each location of your organization has its own scheduling template). Note: To manage time blocks for scheduling templates, your user account must have rights to "Review Location Information" and "Manage Location Information." Select an Operatory that you want to add a time block in. Click (or tap) the starting time on a day of the week. Click and drag (or tap and hold and then drag) from the starting time to the ending time on a day of the week. The Time Slot dialog box appears. Select an Operatory that has a time block that you want to make a copy of. Click (or tap) the Copy time slot button in the lower-right corner of a time block. Click (or tap) the time when you want the copied time block to start. You can place the copy on the same day as or on a different day than the original time block. However, time blocks cannot overlap, and you cannot copy a time block to another operatory. If needed, you can edit the copied time block by clicking (or tapping) it; otherwise, ignore this step and the steps that follow. Enter (or change) the title for the time block if desired, and set up all other options. Title - A name for the time block. The title does not have to be unique across days or operatories. Day Of week - The day of the week for the time block. Available - The time range for the time block. Providers that can be booked - The providers for the appointments in the time block. To add a provider, click (or tap) in the box, and then select a provider (or All providers) on the list that appears. To remove a provider, click (or tap) the X next to that provider's name. Color - The color for the time block. The selected color is used for the border, and a lighter shade of that color is used for the background. What type of appointments can be booked online? - For this time block, either select Recare (to allow patients to book online when they receive email and text message reminders), New Patients (to allow new patients to book online using your practice's website), and/or Existing Patients (to allow existing patients to book online using your practice's website); or select None (to not allow online booking). What appointment reasons can patients choose from? 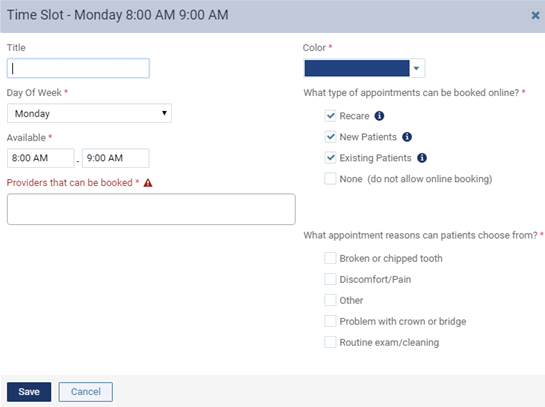 - If patients can book appointments online in this time block (Recare, New Patients, and/or Existing Patients is selected), select the reasons that patients can choose from to schedule their appointments. Tip: To help you identify which time blocks are for which providers in a selected operatory, you can Filter by Provider: with All selected, all time blocks appear normally; with a specific provider selected, the time blocks for that provider appear normally, and other time blocks appear faded.